A brand name laminate very commonly used for countertops, made of several layers of paper or fabric with melamine resin. Formica solid surfacing is a different type of material. It is a single layer, made of acrylic resin mixed with mineral fillers. It is non-porous and durable. 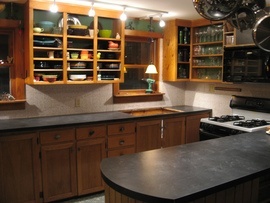 Formica's heat resistance and ease of cleaning make it a good choice of material for countertops. It is also available in a wide variety of colors and styles. Traditional formica countertops are inexpensive and easy to buy and install, however they are prone to damage from heat or scratches, and it is difficult to replace only the damaged section.